SOLD Grundriss der stadt und des hafens von: Ludwigsburg, Havana, Cartagena, Portobello. Title: Grundriss der stadt und des hafens von: Ludwigsburg, Havana, Cartagena, Portobello. 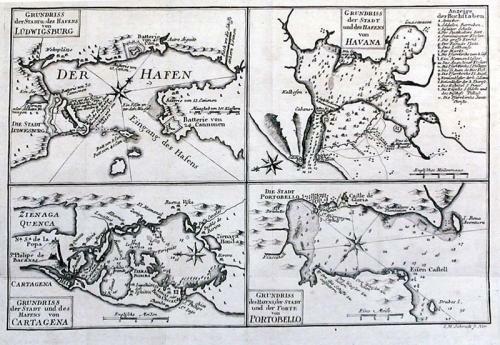 Description: Four detailed charts of the towns and harbours of : Louisburg (Cape Breton Island), Havana, Cartagena, Portobello. The engravings show forts and gun emplcements as well as detailed soundings of the bays. Of special interest is the engraving of a semaphore post at 'Eisen Castell' at the entrance to Portobello harbour.